I recently learned that although natto is most popular in Japan, it is fairly well known and appreciated in many other countries in Asia such as China, Korea, Taiwan and Singapore (3). A number of other Asian cultures also turn out to have developed unique traditional foods made from Bacillus-fermented soybeans, similar to natto. For example, Koreans have a fermented soy food called "doenjang*" which is historically made by grinding boiled soybeans into a paste that is then shaped into blocks (called meju), wrapped in dry rice leaves (supplying natural Bacillus subtilis bacteria), hung outdoors and later put into ceramic urns to ferment for a few months (1,2). Similar to Japanese miso*, matured "doenjang" paste is used as a base to make a soup into which tofu and vegetables are added. This soup/stew, called "doenjang jigae" is a Korean favorite comfort food-- "healthy, stinky but very delicious", I was told (3). I had to find some. 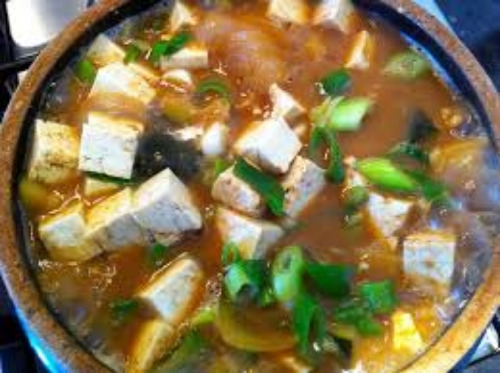 * Doenjang paste resembles miso in its usage as a condiment/soup base; however, miso is made by a very different fermentation process involving salting and utilizing a fungus/mold (Aspergillus oryzae) instead of Bacillus bacteria. Upon recommendation (3), I went to BCD Tofu House in Koreatown to try doenjang jigae. The restaurant was packed, mostly with Koreans, a positive sign that the food would be authentically good. The waitress tried to gently steer me away from ordering the dish, but I assured her that I knew it was "smelly" and had come to the restaurant specifically to have it. A few moments later, the doenjang jigae arrived bubbling hot and, as promised, emitting a vaguely pungent, fermented aroma. I actually found the smell to be quite mild and pleasant, definitely similar to natto. It was absolutely delicious; I finished every last drop. Hmmm. Possibly a new project for NYrture to work on in the future? References: (1) Wikipedia [doenjang]: http://en.wikipedia.org/wiki/Doenjang (2) Tamang, J.P. and Kailasapathy, K. (2010) Fermented Foods and Beverages of the World. CRC Press. (3) personal communication from the great gals of Kopi Coffee (www.kopinyc.com) and VodkaCleanse (www.vodkacleanse.com) at OFI.